So our home time had arrived. We packed up our cases and we decided to call in at Disney springs for a few hours before our flight. We decided on Earl of sandwich for lunch. DH and I both got the holiday turkey, this was as delicious as always. These were $6.99 each. 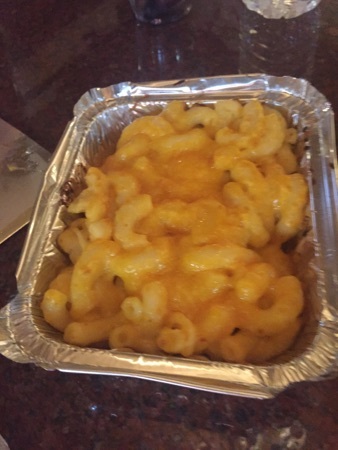 DD had the Mac and cheese, this was $4.99 and she ate about half and DH finished it off. 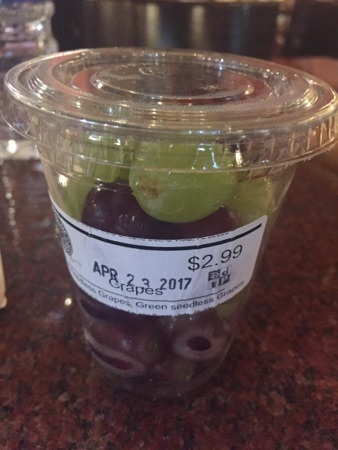 DD also got a pot of grapes for $2.99, she ate all of these and enjoyed them. It came to a total of $21.05 with out DVC discount taken off. We arrived at the airport at 2.30pm for our flight scheduled to leave at 5.55pm. We headed over to the premium economy queue to check in and there was hardly anyone else there! It took 5 mins to get through security and we spent time chilling at the gate. 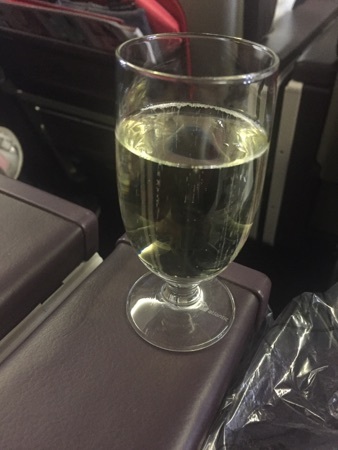 We boarded about 5.30pm and when we got sat down they brought us a class of fizzy wine. It was very nice and such a novelty having real glass! We took off a little late and shortly after they came round with a drinks service. 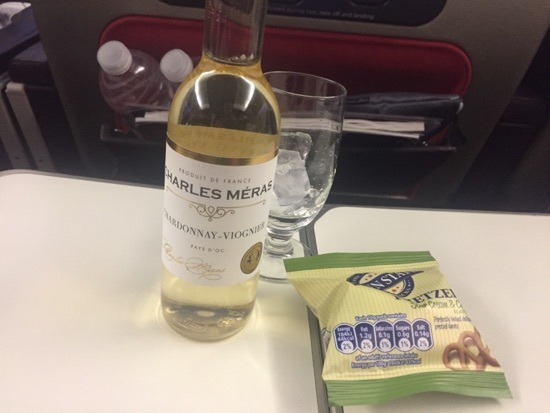 I had a white wine and the standard cheese and choice pretzels. About an hour into the flight they came around with the evening meal. It was a choice of chicken, beef stew or vegetable lasagne. We all chose the chicken. It came with a salad with olive oil and balsamic dressing, a bread roll, butter, crackers, cheese and a flapjack cake. The food was pretty average. The chicken was the best thing there. It came with rice, beans and a roasted pepper. 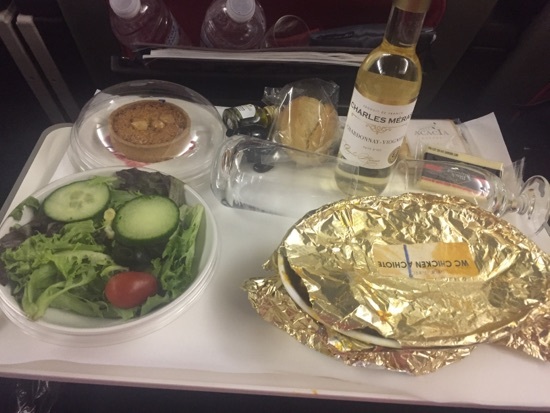 I also had a white wine with the meal. 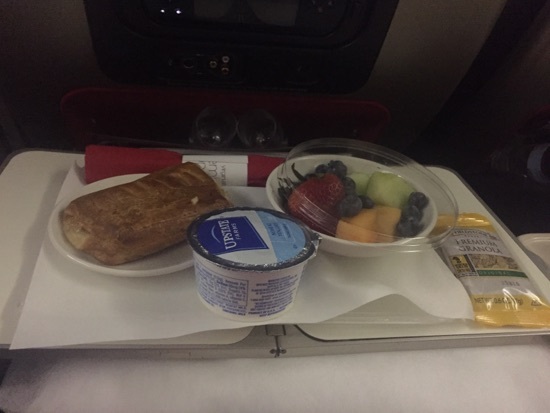 An hour and a half before landing they came round with breakfast. This was an apple strudel pastry which was far too sweet. A pot of yoghurt and a pouch of granola, the yoghurt was warm so didn't eat his either. And a bowl of fruit salad, you can't really go wrong with fruit salad. We ended up making up our delayed time and landed exactly on schedule into sunny Glasgow. We've had an absolutely wonderful time and the holiday blues are somewhat softened by the fact we will be returning in 104 days. Thank you to everyone who has read along with our food exploits. New Photo Added by missdopey - 23 Apr 17 8:19 PM. 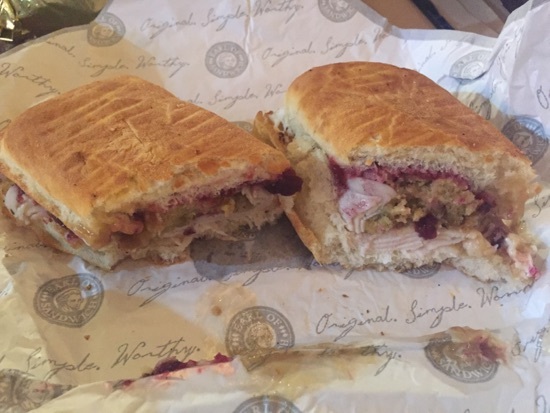 Love an Earl of Sandwich, thanks for posting! A really good food report, thanks for taking the time to share it with us. 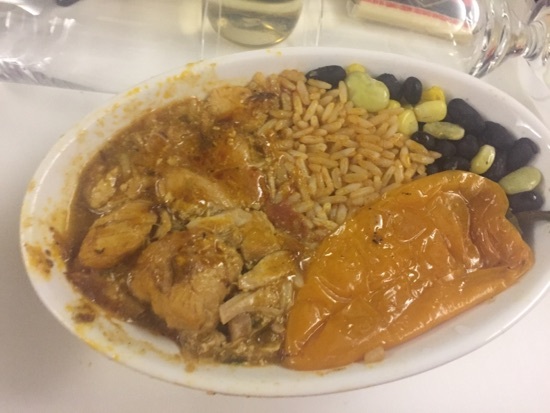 Your plane food doesn't look to bad. Really enjoyed your trip report, having had a nice lazy afternoon reading it all.